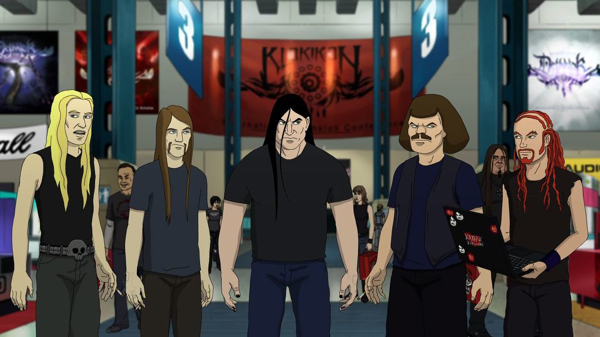 Extreme metal band Dethklok, better known for their animated version on Adult Swim’s “Metalocalypse” series, are ready to release their third studio album, simply titled ‘Dethalbum III’, which hits American stores today, on October 16th 2012 via Williams Street Records. For those who are new, the real-life version of Dethklok comprises of Metalocalypse co-creator Brendon Small on vocals, guitar & keyboards, Gene Hoglan on drums and Bryan Beller on bass, These three musicians compose and record music that’s released as the ‘Dethalbums’, and also used as soundtracks on the cartoon show. Along with touring guitarist Mike Keneally, they perform gigs under the Dethklok name and bring this music on to the stage. I think that’s enough of an intro, now I’ll come to the music on this new album. While I enjoyed most of Dethalbum I, the follow-up Dethalbum II was a bit disappointing from the musical point of view. Honestly, I’m not a big cartoon fan and never really bothered to watch Metalocalypse after its first season, so the music alone matters to me more than anything else, and I only get to listen to it via these Dethalbums, and not on the show itself. The first album was excellent, I thought, and the songs on the second one sound like they must have worked well as soundtrack bits on the show, but not necessarily stood up on the sheer strength of their musical content. That’s the biggest change to come about in Dethalbum III. It’s musically far superior than the first two. “I Ejaculate Fire” gives the album a fantastic start. The riffs are beyond solid, and the keyboard melodies blend in with the guitar to create quite a catchy tune, even though Brendon Small’s vocals maintain a degree of brutality in it. But it’s really his work on guitar that impresses most. The quality of the guitars rises another notch further in “Crush The Industry”, and with its varying patterns and tempo changes, it’s sure to delight extreme metal fans and guitar enthusiasts alike. The album gets more interesting with each passing song, as “Andromeda” throws a crushing combination of straight-up death metal and relentlessly fast power metal to knock listeners off their feet. I see this as a certainty in the band’s live shows. These three tunes give a fair indication of what this album’s about, and the remaining nine tracks, such as “The Galaxy”, “Starved”, “Ghostqueen” and the others present some more variations of the same musical elements along with some new ones, and altogether it makes for a thoroughly enjoyable listen not only for Dethklok fans, but for extreme metal fans in general. 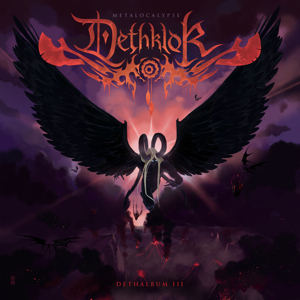 Quite a lot of the guitar work has a virtuosic type of feel to it, and I feel may be Brendon Small’s songwriting style for his solo album ‘Galaktikon’ has bled into this new Dethklok album, which I certainly don’t mind. I think he has written this with more freedom and has let his musical instincts take over, rather than worrying about whether it fits the image of the animated Dethklok and the Metalocalypse series. The show is so immensely popular these days that he doesn’t even need to worry about that, I guess. Whatever it was that inspired his creativity, it has resulted in a more ‘serious’ musical composition, if I can call it that, and I, for one, am definitely taking him more seriously as a musician after listening to ‘Galaktikon’ and ‘Dethalbum III’. With that being said, the legendary humor element of Dethklok, made famous by songs such as “Murmaider”, is still there in the lyrics and some of the song titles, but that aspect is better implemented in the animation series. Coming back to the music, judging from the guitar work on these albums, I’d say he is well capable of touring solo, alongside the likes of Marty Friedman and Jeff Loomis, if he so chooses to. Production-wise the album sounds crisp and the mix is well-balanced. All in all, ‘Dethalbum III’ is a killer set of tunes which will not only leave first-time listeners pleasantly surprised, but looks set to boost the intensity of the band’s live performances. This is indeed worth the purchase for extreme metal fans.